Barry Allen voiceover, huzzah! I don’t want to put too much emphasis on the whole Arrow/The Flash thing but I just have to say: the difference between The Flash's intros and Arrow's intros is incredible. Barry even uses the word "thingy" in his. I love you, Barry. In spite of your angsty backstory, you're basically a Labrador puppy made of light and dandelion fluff. Here's a confession: I wasn't all that impressed with The Flash when it started up. The Metahuman-of-the-Week formula reminded me too much of early Smallville seasons for me to really get drawn into the weekly plots, but the characters - and Barry Allen especially - made me want to tune in for new episodes. 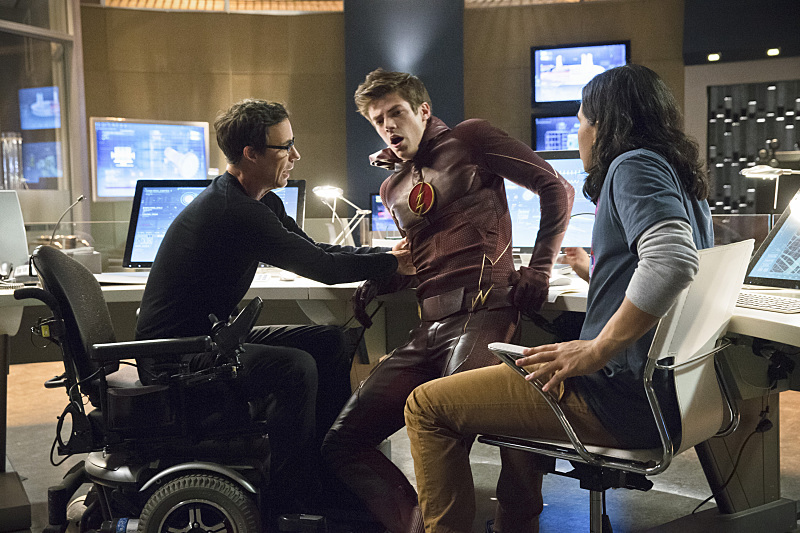 The Flash is a pretty lighthearted, positive show without being all inconsequential nonsense. It takes the idea of superheroes and doesn't try to mask it with unnecessary darkness, or sadness, or drama in order to bring the unbelievable nature of super-powered people down to more "earthly" levels. It doesn't assume that you have to have a brooding, pained hero in order to have a relatable hero, or one with a journey worth watching. Barry's journey – one of an intelligent young man with a good heart, who is given a gift and decides to use it to help people and do good things but has to learn how to make that happen – is just as worthwhile and interesting as any other. These first episodes have Barry stumbling along, trying to figure out how best to use his powers without upsetting the people he cares about or completely messing up his regular life. He has to try to be a hero without scaring his foster father half to death by putting himself in danger and without disappointing his best friend/crush, Iris, by missing out on appointments and promises because he was busy saving people from burning buildings and figuring out the week’s latest villain. This balancing act is a common theme in superhero stories, but that doesn't matter because it’s still entertaining to watch. But also, it’s the team behind Barry (and the fact that we don't have to sit through season after season of Barry lying about his powers to the people he loves) that really makes The Flash enjoyable. Okay, so – the episode! Like I said earlier, the first half or so of the season was a lot of Metahuman-of-the-Week stuff. This week is a guy who can duplicate himself (including clothing? How? Is it skin-clothing? That's creepier than the duplication, actually) and uses his power to steal a lot of stuff and wreak some havoc. Also, he tries to kill a guy who wronged him in the past. As one does. But the more appealing story is the one that happens in Barry's life, not The Flash's heroics. Some tension arises between Barry and Joe West, because Joe – understandably, since he's basically Barry's father and loves him – doesn't like this whole "superhero" business Barry's gotten himself into. Barry is fast, but he's not immortal and he's not impossible to hurt, and Joe doesn't want to see Barry hurt. Joe West might not be Barry's biological father, but he's the man who raised him and cared about him and, well, Barry says it best when he tells Joe at the end of the episode, "You’re just the man who kept me fed, and in clothes. Who sat beside bed at night until I fell asleep because I was afraid of the dark. You helped me with my homework, you taught me how to drive, and shave. And you dropped me off at college…" There is nothing Barry can do to make Joe stop worrying about him – there's no superpower in the world that can stop that – but Barry feels a need to put his powers to some good and be a hero. Both Barry and Joe learn and grow in this episode and I think they understand each other a bit better by the end of it. As with most shows of this type, the “superhero” story feeds into the “secret identity” story and Barry’s struggles with fighting against the self-duplicating metahuman mingle with his struggles in his everyday life. In this case, it’s Joe’s protectiveness that comes back to Barry when he’s out in the field. Dejected after losing a fight with the Cisco-dubbed “Multiplex,” Barry leaves S.T.A.R Labs and, presumably, the whole superhero business in general with the understanding that maybe Joe was right when he said Barry couldn’t do what he’s been trying to do and shouldn’t try to be a hero. It takes Dr. Wells explaining to Joe that the opinion of someone as important to Barry as Joe West is could have terrible consequences for Barry. The things that happen in the life of Barry Allen affect The Flash, too, and if Barry has doubts – doubts that, say, stem from his foster father not believing in him – all the things Joe is afraid of happening (Barry getting hurt, or killed) could happen. I think that the importance of Barry’s “support group,” so to speak, is handled very well in this show – better than a lot of superhero stories handle teams or loved ones. The people around Barry or around The Flash aren’t just fodder for villains to kidnap or threaten, aren’t just there to spout exposition or pseudo-science – they’re a huge part of Barry’s journey. Although the episode plots get more intriguing later on as they move away from the Metahuman-of-the-Week formula, I still maintain that the real heart of the show will always be Barry and the relationships he develops and how those relationships help him become a hero. In this episode, Barry’s success hinges on Joe’s opinion of him but as he grows closer to his team at S.T.A.R Labs, their opinions start to matter a lot, too. Their ideas, their belief in his abilities, their concern – all these things work toward making Barry the hero he needs to be. The importance of Barry’s friends and family comes to the forefront in “Fastest Man Alive” when he tells them that “[they] were all struck by that lightning” when Barry got his powers. Because without his team, there would be no Flash – and it’s my personal opinion that, without his team, there would be no show. I loved Barry's "Heeey, Caitlin! How was your day?" It’s like he got caught sneaking out past curfew. Did the show ever use Barry's Sherlock Holmes vision again? I can't remember another instance outside this episode. Oooh, Joe, you're the one who started the "Don't tell Iris" thing! Bad, Joe! Tsk. Cisco calculates the food Barry needs to eat by using tacos as a unit of measurement, which is just one of many reasons why he's the best. Barry zipping around confessing to Iris was cool, but I'm not really sure he should've been able to move that fast this early in the show? “You got blood on my suit.” Cisco is so protective of that suit. Look, I’ve seen this whole season and I still don’t really get how they convicted Barry’s father of a crime that seemed to have no physical evidence pointing to him as the culprit. They sort of dropped the whole “clothes catch on fire if Barry’s not wearing the suit” thing, didn’t they? “Harrison! Don’t get up.” Woah, wheelchair jokes are uncool, dude. I mean, we know he’s secretly evil, but you don’t. Barry poking the empty clone in the lab. Heeee. Jesse L. Martin is so good as Joe West, you guys. Seriously.